Glenn Withers[i], Australian National University (ANU) and the University of New South Wales (UNSW) Canberra. Once a year when ARC grants were announced, those with esoteric titles would be denounced by backbenchers in parliament. Once a year when state auditors general would report on university accounts, those in the red would be excoriated in the media. There are, of course, countervailing considerations for each of these concerns. Professor Ian Gust has pointed out that neither Elizabeth Blackburn’s studies on single cell pond dwellers nor Peter Doherty’s work on choriomeningitis in mice would have passed some backbencher “pub tests”, but they did impress the Nobel Prize Foundation. Or note the leading ARC grant application cancelled by then Minister Birmingham looking at the Straits of Gibraltar. Guess which issue almost stopped the Brexit deal last week due to Britain’s misunderstanding of the Spanish psyche on the Gibraltar Straits? Or think of the esoteric titles in social sciences ranging across computable general equilibrium analysis to utilitarian ethical paradoxes, and then look at what such social science analysis has brought to the very foundations of this nation, ranging from Medicare through HECS to immigration points and compulsory superannuation (see Annex 1). And were we to add up their economic significance, this would be a very impressive dollar contribution to the nation indeed. Which brings me to university research funding. Let me ask: Do we really need a government national interest test here, as emphasised by current Education Minister Tehan? Well actually they have one and it is deficient, as Senator Tehan helps us understand. To borrow his phrase, “it beggars belief” that the government’s own statement of national priorities does not mention research into regional higher education!!! do likewise for applied research through the TAFE system, just as government does already in other massive areas of public R&D funding such as DSTO, BoM etc. institute a revenue contingent loan scheme based on private research partnerships with universities and TAFES etc. In the process, the government would eliminate the massive inefficiency in the present competitive grants scheme arrangements. If you impute the value of the voluntary time devoted to grant processing and gave it instead for universities to administer, front-line research could increase massively. Moreover, to come to the economics, research pays a social rate of return of 20-30% (yes, with huge variance but massive pay-off by the winners -think Gardasil, Wi fi, Child Support innovation), way ahead of the public hurdle rate for good investment. It can be at the core of a new Australian future that transcends our present political impasse. Almost all universities in Australia are not-for-profit entities such that red or black on the bottom line in any one year is a poor indicator of financial management success, but there has never been a sector deficit or bankrupt university in this country. 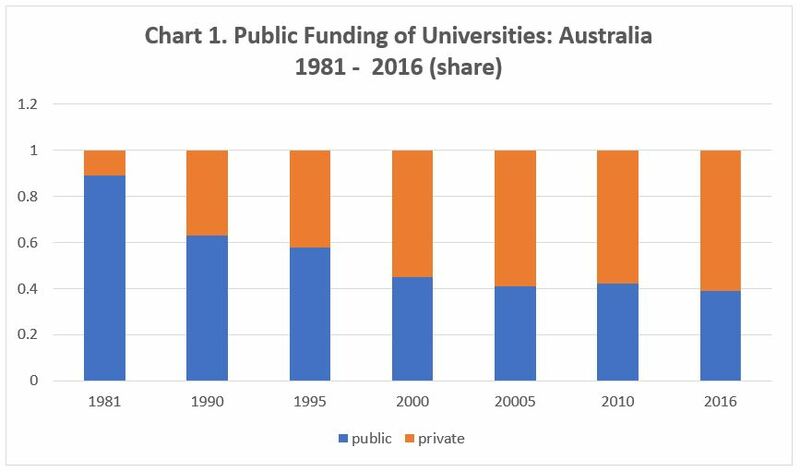 Moreover, the Australian taxpayer does get such excellent value for money because universities here receive only 40% of their revenue from the taxpayer (including HECS subsidies) unlike, say, a European norm of 90%, which did once also apply in Australia (chart 1). To adjust in this way while building Australia’s number three export industry (after the easy ones of iron ore and coal) does rather speak to the management efficiency of the university sector in this country. Australian education exports totaled $32.2 billion in 2017. Total Commonwealth government funding of universities in that year was $10.77 billion. Not a bad rate of return in that dimension alone. Whatever employers might say, they are evidently willing to pay a substantial premium for university graduates, as seen in the familiar age-earnings profile analysis shown in chart 2. The average graduate still receives more than $1.5 million across their lifetime compared to a school-leaver with no further qualifications. Moreover, it is worth adding that education is a mutual responsibility such that firms have their own rarely discussed or acknowledged obligation to be ‘graduate-ready’, especially for firm-specific skills. Regrettably, surveys of global management standing put Australian management well down the rankings, and especially so in areas such as human resource management. A little more co-operation and a little less blame-shifting would help. To this end I once proposed a National Internship Program at the request of Prime Minister Kevin Rudd. His departure meant it was lost, but it is still there in a bottom drawer for any party looking for good ideas (Recommendation Four). For the part of the universities, more attention to interdisciplinarity and to more generic personal skills would assist. The Chief Scientist is on record as opposing any watering down of rigour in education, such as for the teaching of mathematics, including in schools. He is half right. Equally each Secretary of Prime Minister and Cabinet regularly makes speeches as to the need for knowledge integration. These too are half right. Put them together and we are closer to an answer: we can have it both ways. What is wanted is rigour plus. It is, for example, not a choice between hard skills and soft skills. Good pedagogy blends them. What is taught matters. So does how it is taught. A great math class can still matrix teach using methods that advance class leadership, diversity, integration, communication and more – all while actually enhancing core mathematical capability and understanding. Improving STEM pedagogy would go a long way to improving STEM employability, which continues as an issue. And HASS can do the same. It is wrong to assume or imply that rigour and personal skills are inherently antithetical. For universities, they must advance this form of blended teaching, A dedicated Enhanced Teaching Fund from government would assist. (Recommendation Four). Chart 2. The Age-Earnings Profile, Australia, by education level. See comments on Grant Relevance above! While functional in narrow economic terms, let me emphasise also matters beyond the felicitous calculus and just look to make the point at the role of Australian thinkers from the social sciences and humanities whose ideas have been hotly contested and criticised and yet ruled the world. Australians may only be a small percentage of the world population, as hard-core climate sceptics are want to remind us. But, by heavens, we can ‘punch above our weight’. Danny Green here in Western Australia could be added to the list- and no doubt these days would be a product of one of the sports degree universities. What is exciting though is that primary education is now nearly universal and that by 2040 so will be secondary education. The pyramid of chart 3 is becoming more of a Tower of Knowledge, just like the age pyramid of demographers and, in part, for some common reasons. By 2040 the historical world of educational disparity in attainment will have gone for schooling. All across the globe education to completion of secondary education will be near universal. Chart 4. 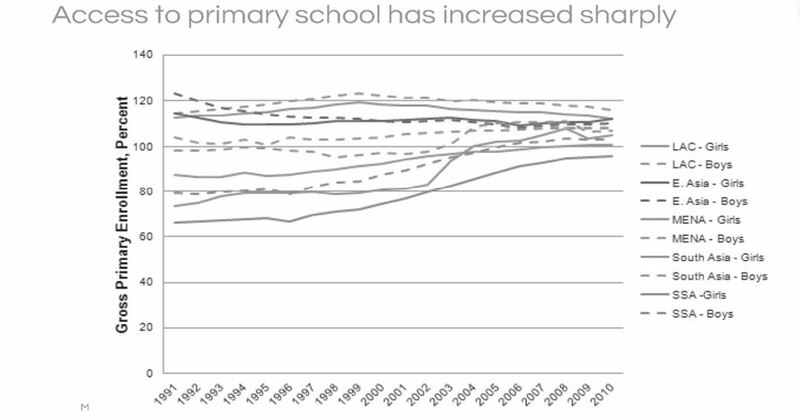 Global Patterns of Primary School Access, 1991-2010, by region (enrollment share). In a world where so much is dismal, such a fundamental advance is a source of considerable solace. Moreover, I think there is much we can look forward to, as global participation in tertiary education increases. It is the next true frontier in global development. Australia is immensely attractive to international students. The British Council accords us a top internationalisation rating. Australian domestic higher education participation is now leading in the OECD. The Lisbon Council accords us a top system rating. Now note that, for those interested in equity analysis, this is for the Australian system as a whole. All our universities are good. Australia’s universities are not complacent and are always pushing ahead. They have been innovative in areas like international education, distance learning, and work integrated learning – there’s a range of things they’ve done that have kept them in the game when government has reduced funding. They have found these other sources of revenue. But the game is that of a squirrel in a barrel, running to stay in place. The more the universities are successful, the more the government withdraws funding and, bizarrely, the more it also seeks to impose regulation despite its progressive abdication from the field. a rising compromise to the student experience especially in class size and academic expertise, and study hours, as seen in our comparative international student standing on this criteria. a functionalist approach to international education rather than a balanced focus on two-way education, research and engagement. failure to properly address equity in tertiary education. Middle class domestic female participation increase has been great as has that of middle-class internationals. But what about the workers? Conclusion: What can we do better? Let me focus on equity, given the nature of this conference. Well, lower socioeconomic absolute numbers have indeed increased with massification, which is good. But relative numbers have not. Moreover, the alternative post-school paths for non-university advancement have immiserated. Essentially, publicly funded vocational education and training has had its government support relatively reduced, even more than has higher education. Private vocational education and training, largely unsubsidised, has expanded to fill the vacuum and indeed to encourage some governments to further reduce vocational support. In Australia, vocational education and training is much more a state and territory responsibility than universities, despite most universities being established under state legislation. But states and territories finances have become increasingly derivative of the Commonwealth government because Australia has the highest vertical fiscal imbalance of any OECD federation. This means that the states and territories have responsibilities way ahead of their revenue capacity and so they must largely accept the Commonwealth’s funding priorities. In particular this has. favoured universities over vocational education in recent decades[iii]. The fundamental solution would be to reform Australia’s federal system with more taxing power accorded the states in line with global best practice. For example, shifting the burden of taxation more to the GST and away from personal and corporate income tax would facilitate this. In the absence of this a full and integrated independent review of Australian Tertiary education is needed under, and reporting to, the Council of Australian Governments. The Commonwealth determines the COAG agenda so that considerable pressure must be placed upon the Commonwealth to commit to this. This review would have particular attention paid to the equity aspects of the full system, as well as its pathways integration. VET has long been more a vehicle for lower SES studies. But in a modern revision it could integrate better and allow cross-flows better. (Recommendation Six). Parallel to this there has been ongoing neglect in Australian policy of student support. There are welfare arrangements in place for very poor students and those in some special categories such as rural and regional. But these are not generous and often tightly means tested. As a result, many potential and able students with less well-off parents choose to work instead of study. And when they do study, they often require market work to fund their living costs. Indeed, Australia has one of the highest levels of paid work when studying part-time and full-time in the OECD. This means that the educational productivity of their studies is substantially diminished accordingly. Finally let me return to the theme of an unbalanced internationalisation. Australia could do much more to retrieve its profile as a supporter of developmental education and training and to ensure Australia itself shares in the insights to be gained from collaborative education, research and engagement beyond our borders and with our neighbours especially. Another modest measure would be government support for Australian participation in the World Bank’s Global Development Learning Network Recommendation Eight). So here too is how innovation can unleash both efficiency AND equity as an underpinning for the Australian future. More can be defined too[iv]. We can break out of our impasse. And inclusive growth [v]through tertiary education and research should be at the very centre of this. Allocate universities all present block and competitive government research funding as a block grant and increase it by 50 per cent. Provide new block grant funding for applied research through the TAFE system, just as government does already in other massive areas of public R&D funding such as DSTO, BoM etc. Institute a revenue contingent loan scheme for innovation based on private research partnerships with universities and TAFES etc. Ensure university teaching skills are enhanced via blended learning pedagogy that advances rigour while also advancing soft skills. Lift the National Academies grant by 50% and ensure consultation for academic freedom and national interest reviews. Establish a full and integrated independent review of Australian Tertiary education, reporting to the Council of Australian Governments. Undertake a thorough review of tertiary student income support including examining the possible the extension of HECS to also permit borrowing for living costs. Provide government support for Australian participation in the World Bank’s Global Development Learning Network. urban planning (think Patrick Troy). trade policy (think Max Corden). agricultural export management (think John Crawford). [i] Professor Honorary ANU and Adjunct Fellow at UNSW Canberra. President of the Australian Council of Learned Academies. Chair of the Global Development Learning Network. [iv] Glenn Withers (2019), “An Australian Humanities Crisis?” in D. Ahlburg (ed), The Changing Face of Higher Education: Is there An International Crisis in the Humanities, London and New York: Routledge (forthcoming). [v] Glenn Withers (2018), “Inclusive Growth: hybrid policies into the future” in R. Breunig and M. Fabian (eds), Hybrid Public Policy Innovations: Contemporary Policy Beyond Ideology, London: Routledge. [vi] Glenn Withers, Veritas Redux, Canberra: Academy of the Social Sciences in Australia, Cunningham Lecture, 2018 and Withers, G. (ed.) (2017), The Social Sciences Shape the Nation, Canberra: Academy of the Social Sciences in Australia (with P.Hanasz plus J.Beaton, L.West, M.Radcliffe and S.Kumar).